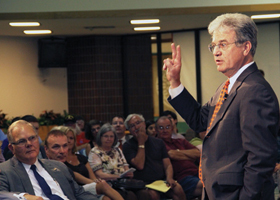 Tom Coburn speaks to concerned citizens during the OKC townhall meeting August 18 in the OCCC College Union. Coburn also took time to listen to individual questions and respond to them. U.S. Senator Tom Coburn (R-Oklahoma) met with local residents in a Town Hall Meeting at OCCC Aug. 18. Speaking before an audience of about 350 in the College Union, Coburn addressed a number of key political issues and topics as he took questions regarding the economy, energy independence, the “war on terror” and what he said he believes to be the most dire problems that the United States has had to confront in decades — a massive deficit and sluggish economy. Coburn opened the meeting by saying that many communities throughout the nation, not just Oklahoma, seem unsettled about the current state of the nation. “There is a tremendous amount of anxiety,” he said. A former member of the Senate’s bipartisan “Gang of Six” group and author of the recent budget proposal he titled:“Back in Black,” Coburn made known his objection to the government perpetually spending money that, he said, doesn’t exist. “You can’t spend money that you don’t have on things that you don’t need and you cannot borrow your way out of debt,” he said. The Senator’s plan, which has gained little traction among fellow members of Congress leading up to the recent “Debt Ceiling” agreement signed by President Barack Obama, calls for summary cuts across nearly every sector of government in order to curb what he calls “out of control” government spending. In his speech, Coburn addressed questions of oil and natural gas consumption and said, beneath the estimated 650 million acres of land owned by the federal government, there was more oil, coal, and natural gas than what lay beneath China, Saudi Arabia and Canada combined. “This is the only nation in the world, where you as citizens own that kind of resource and your government refuses to allow you to take advantage of it,” he said. The question of military involvement in Afghanistan and the possible timetable for withdrawing combat troops from the country was then raised before the Senator who felt that being there provided stability in a volatile region. “In northwest Pakistan lies a nidus of infection of hate for this country and for freedom that has to be controlled,” Coburn said. This was in high contrast to his position on American involvement in Libya. “I don’t think we have any significant national security interest in Libya,” he said. This statement was correlated with Coburn’s wish to re-instill a paradigm of economic dominance on the part of the United States and broadcast it to the rest of the world. “If we had our economy going again, our foreign policy would be different than what it is today,” Coburn said. When asked what he foresees as the future of the U.S. should President Obama be re-elected, the senator provided a blunt response. “I don’t think that’s going to happen,” he said. Coburn said he feels Americans will “get tough” and change the path they are currently headed down, as well as become focused on ridding themselves of debt and electing individuals who better reflected their personal values and beliefs. “I think we’ve got a great future,” he said. Coburn ended the evening by saying the burden of recovery lay on every American’s shoulders and everyone would need to make sacrifices.